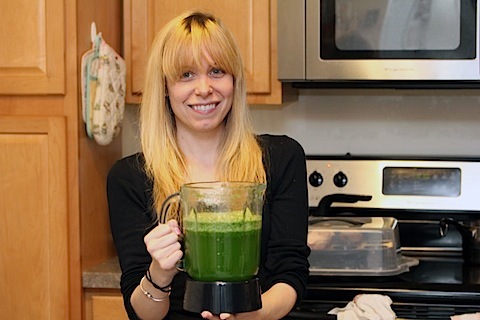 So, yesterday Chels posted about the Herb-Savor (which you can win if you enter here!) and today I’m talking about a lot of basil. I’ve had the worst luck with buying basil lately and having it go bad the very next day. It’s definitely one of the most frustrating things, especially when you have a recipe planned that you’re really excited about. I was lucky that most of this basil stayed good for about 1.5 days. I was nervous because some of the basil at my grocery store already had mold on it on the shelf! How gross is that? I’m definitely planning on getting a basil plant this summer- my sister had one last year that did amazingly well! 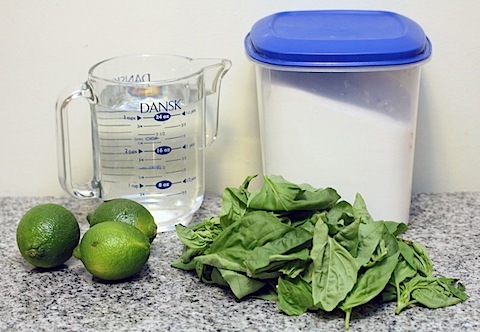 Start by blanching your basil. Boil a pot of water and put the basil in it for 10 seconds. 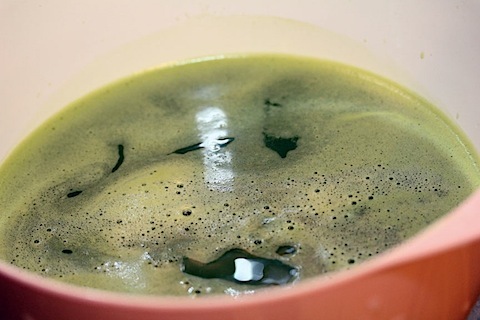 Then remove, drain, and put in a bowl of ice cold water. 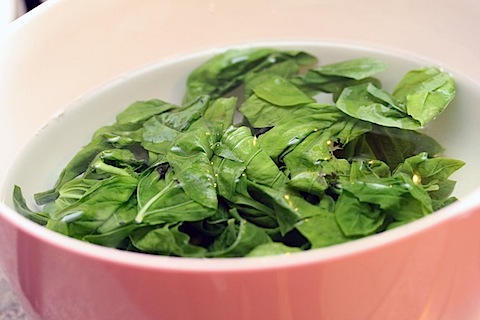 Whatever you do, don’t let those basil leaves spend more than 10 seconds in the boiling water! Hence why I don’t even have a photo of them boiling 🙂 You don’t absolutely have to blanch your basil, but it allegedly helps give the sorbet a nicer, more vibrant color. 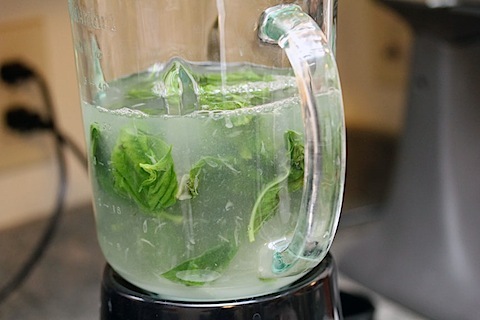 Now, put the basil leaves in a blender along with the water, sugar, and lime juice. 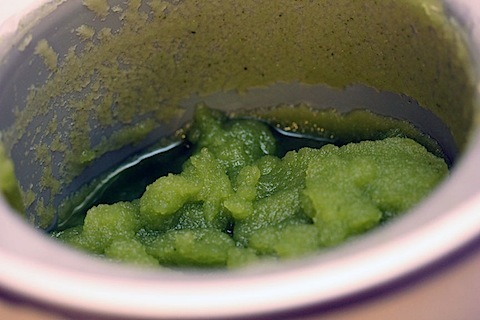 Puree the mixture on high speed for about 1 minute until you have a very smooth and bright green liquid. Looks kinda like a green monster! And smells amazing. The following photo is an example of “hi, I need a major haircut and root touch up disgustingly badly.” Eeek. The good news is I’m headed back to my favorite Boston salon, Rock Paper Scissors, on Newbury Street this afternoon. If you’re in the market for an amazing salon, this is the one! 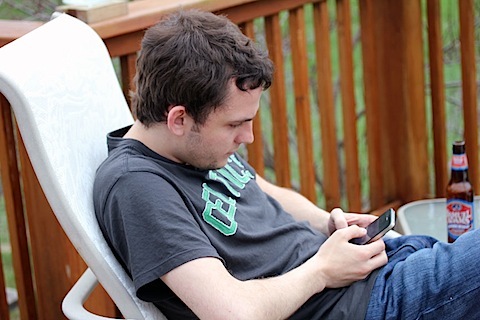 I blogged about it last May, but I love it even more now. Perhaps I’ll share another photo of my hair transformation after I see Sami tomorrow! 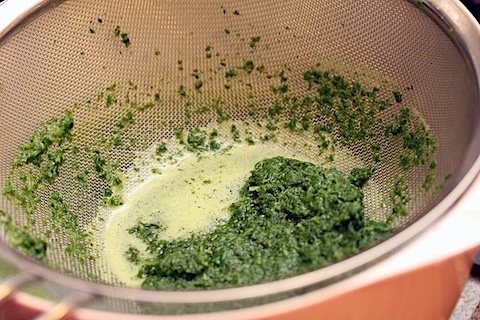 Pour through a fine mesh strainer, so you can catch all the non-pureed particles. And you’re left with a fabulous, Ecto Cooler like liquid (also, isn’t it weird that I’m typing this IN the blogging software Ecto and it’s spell-checking its own name?). Now freeze in your ice cream maker following manufacturer’s directions. In my KitchenAid ice cream maker, that basically means just process it in the already frozen bowl for a while. Mine took about 40 minutes to really freeze up and look like sorbet. Then stick it in the freezer for at least 3 more hours or overnight. When I woke up on Saturday morning, it really looked like sorbet! Um, a kind of ugly color sorbet, but still sorbet. 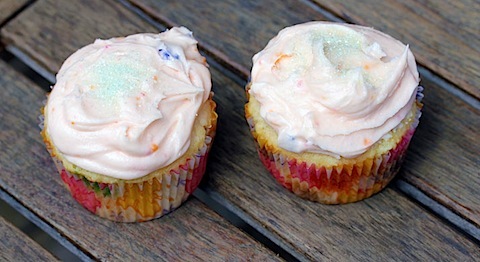 In the meantime, I also made some jellybean cupcakes. In the spirit of Easter, I couldn’t resist! Chris has a legit jellybean addiction, so I thought it would be fun to try working them into a cupcake. 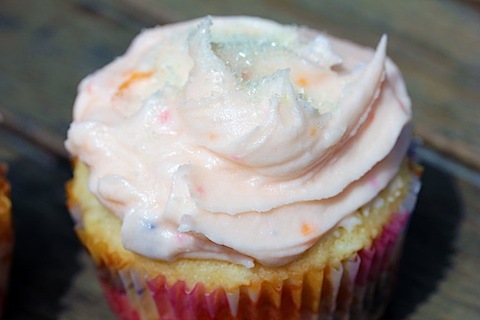 I actually used my white wine cupcake recipe and just included chopped up jellybeans. I also put lots of ground jelly beans in the frosting. And am pretty sure I broke my Cuisinart Mini Chop in the process. It was for the sake of the jelly beans! Chris appreciated them 🙂 But I think he appreciated the fact that the Celtics swept the Knicks even more. Boy moves here from Virginia less than 3 years ago and suddenly he’s the biggest Boston sports fan I know! 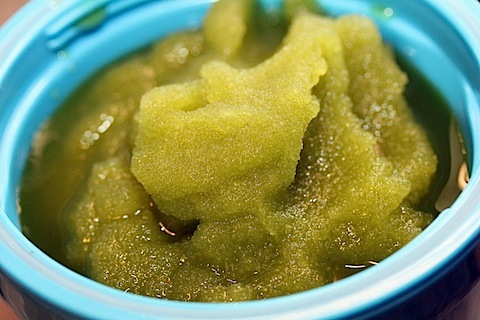 Anyway, back to the basil sorbet. It was unique, refreshing, and super flavorful. I think my family was a bit apprehensive about a sorbet smelling so strongly of basil at first, but then they all enjoyed it immensely! Mine was definitely a lot more basil than lime, so I added a bit of lime juice to the ingredients above to balance it out for you. Everyone said this would be an excellent palate cleanser for a big meal and I have to agree. But the color… I know. The color was less than stellar. Also, as my mom pointed out, nobody would eat a bowl of sorbet this big. But I don’t think that’s true. Because I would. Wouldn’t you? So, if you unfortunately do not win the Herb-Savor, you should just take all that basil that’s about to go bad and make this. Next, I think I want to try a sorbet with thyme or rosemary. Stay tuned for my Cocktail Friday drink this Friday that involves thyme. It’s a simple one, but a good one for the summer! What’s your favorite sorbet flavor? Any unique flavor combinations? 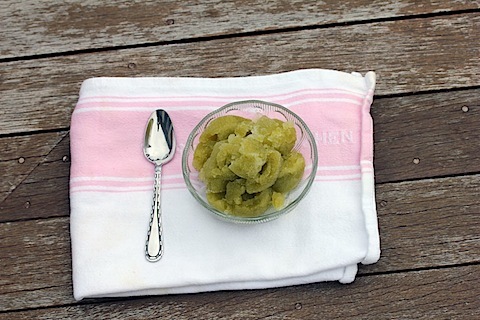 26 Responses to "Basil Lime Sorbet"
Want a fun treat! great summer flavor and I am sure super refreshing! that sounds so refreshing for the summer! Oh my gosh I think this sounds divine! This is definitely unique! I’m a big fan of blood orange sorbets! that’s so cool! i was just thinking about making basil/strawberry sorbet, or trying to figure out how to use my GIANT rosemary bush in some sort of sweet application. i actually really like the color. in a pink bowl, it’d be adorbs. It sounds amazing, but I’m with you on the color. Not so appetizing. How about infusing the basil, rather than blending? Now I wish I had bought some basil when I had a chance. This looks delicious. I’m wanting to try a pomegranate sorbet and a strawberry black pepper sorbet. This sorbet sounds so freaking good!! In Arizona we live on this type of food during the summer!! I would eat a bowl of sorbet that big… even if it was that color! This looks like a delicious refreshing treat! The color doesn’t matter as long as it is tasty, and it sounds very refreshing. 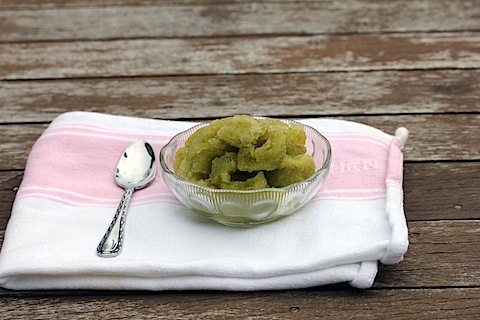 I bet it was nice and flavorful…definitely not the prettiest sorbet, but they can’t all be, right? 🙂 My favorite sorbet is orange…nothing unique about it, but it always reminds me of these push-ups we used to eat as kids! Yum! Very creative and a great combination of flavors. Definitely have to try this soon. And you should give the basil growing a try. I grow a fairly large herb garden every year and basil is one of the easiest. 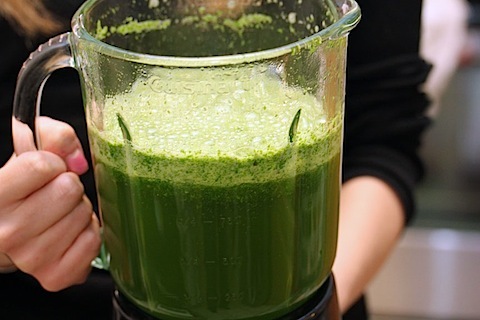 This looks great, and so refreshing! Can’t go wrong with ice cream, but I definitely prefer sorbet on the insanely humid, summer days. Mango sorbet, any day! Yum, yum, yum. Maybe I’ll try making a batch! This sounds GREAT! 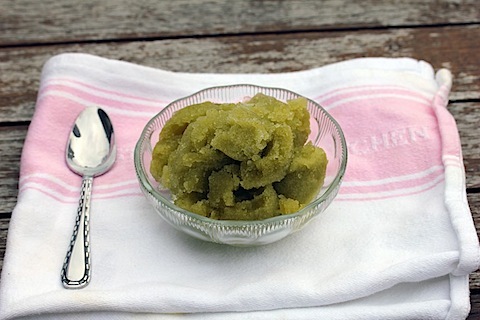 I love fruity sorbets but have yet to make my own! Such ingenuity and vision! I feel like I fall into ruts sometimes and get chefs block sometimes but you never seem to come up short! This must be so fresh and tasty! Such an interesting combination of flavours! That sounds so light and refreshing! 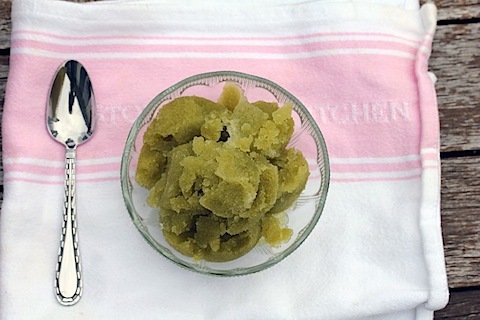 The basil lime sorbet, that is. I recently learned that if you wash your basil and then dry it completely so it’s not wet at all and then wrap it in an air tight container with a damp paper towel…it will keep for up to a week. I tried it and it totally worked. It might not work every time, but it definitely did the trick for me. I need an ice cream maker…I want to gobble it up!